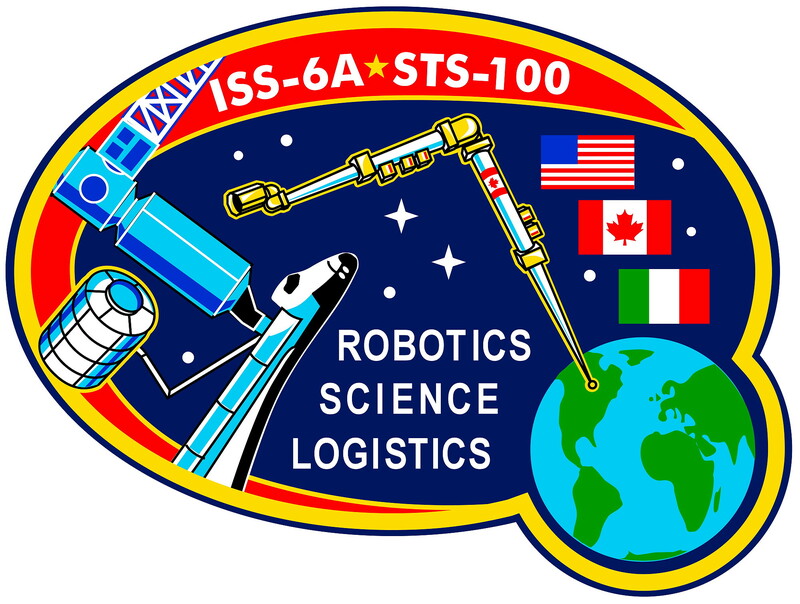 The highest priority objectives of STS-100 (ISS-08-6A MPLM Raffaello) were the installation, activation and checkout of the Canadarm2 robotic arm on the station. The operation of the arm is critical to the capability to continue assembly of the International Space Station, and was also necessary to attach a new airlock to the station on the subsequent shuttle flight, mission STS-104. A, final component of the Canadarm is the Mobile Base System (MBS), installed on board the station during the STS-111 flight. The Canadarm2 is a space robotic arm of unprecedented capabilities. The station arm will be able to move more than three times as much mass as the shuttle's robotic arm - a mass greater than even a 100-ton space shuttle. The station arm also will have an amazing capability to move end-over-end about the station's exterior, in inchworm fashion, using either end to manipulate cargos. It can provide electrical power and make computer connections with the things it moves and has greater flexibility than the shuttle arm. It measures 57.7 feet (17.59 meters), about 7 feet (2.13 meters) longer than the shuttle arm, and it is designed to be disassembled and repaired in space if necessary. 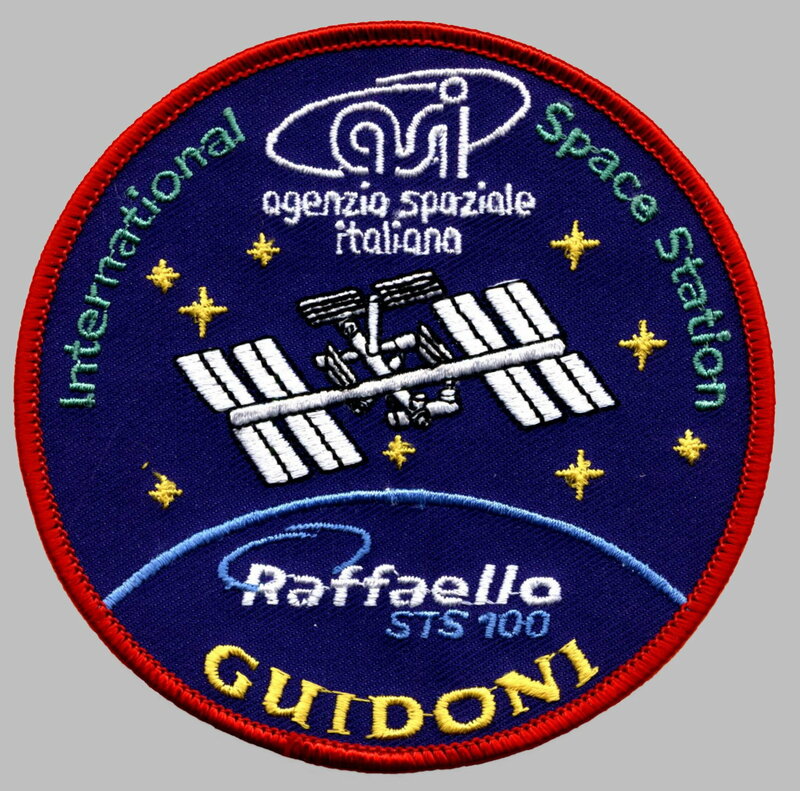 Other major objectives for Endeavours mission were to berth the Raffaello logistics module to the station, activate it, transfer cargo between Raffaello and the station, and reberth Raffaello in the shuttle's payload bay. 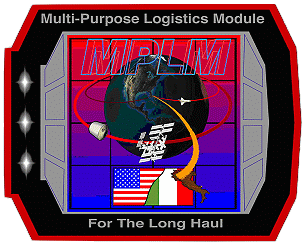 Raffaello was the second of three Multi-Purpose Logistics Module (MPLM) developed by the Italian Space Agency (ASI) that was launched to the station. 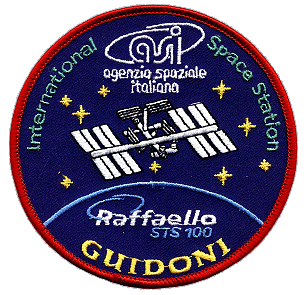 The Leonardo module was launched and returned on the previous shuttle flight, STS-102, in March 2001. Endeavour's crew spent the first full day in space checking out the equipment that was used for the mission's upcoming major activities. Checks were made of the spacesuits and space-walking gear; the shuttle's robotic arm; and the controls and tools used for the final rendezvous and docking with the station. 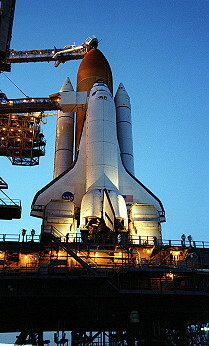 The crew also powered up and prepared the shuttle's docking system and performed several engine firings to fine-tune the rate at which Endeavour closed in on the station. Endeavour's rendezvous and docking with the International Space Station began with the precisely timed launch of the shuttle on a course for the station. 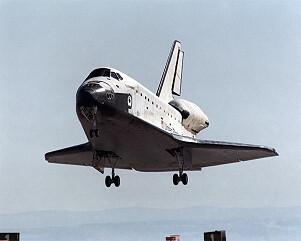 During the first two days of the mission, periodic engine firings gradually brought Endeavour to a point about 9 ½ statute miles (24.6 km) behind the station, the starting point for a final approach to the station. About 2 ½ hours before the scheduled docking time on Flight Day Three, Endeavour reached a point about 50,000 feet (15,240 meters) behind the ISS. 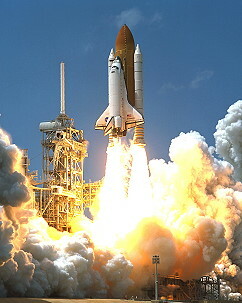 At that time, Endeavour's jets were fired in a Terminal Intercept (TI) burn to begin the final phase of the rendezvous. Endeavour closed the final miles to the station during the next orbit. As Endeavour closed in, the shuttle's rendezvous radar system began tracking the station and providing range and closing rate information to the crew. During the approach toward the station, the shuttle had an opportunity to conduct four small mid-course corrections at regular intervals. Just after the fourth correction was completed, Endeavour reached a point about half a mile (900 meters) below the station. At that time, about an hour before the scheduled docking, Commander Kent Rominger took over manual control of the approach. 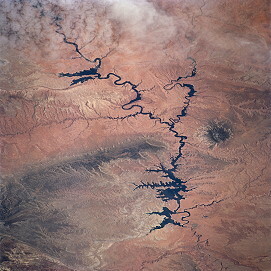 Kent Rominger slowed Endeavour's approach and flew to a point about 600 feet (182.9 meters) directly below the station, from which he began a quarter-circle of the station, slowly moving to a position in front of the complex, in line with its direction of travel. 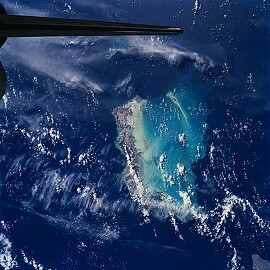 Kent Rominger was assisted by Pilot Jeffrey Ashby in controlling Endeavour's approach. Mission Specialists Chris Hadfield and Scott Parazynski also played key roles in the rendezvous, with Scott Parazynski helping with the rendezvous navigation and Chris Hadfield operating a handheld laser-ranging device. 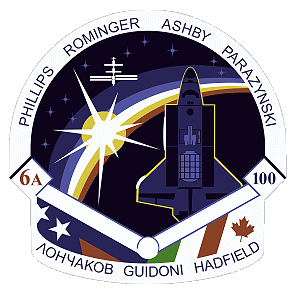 Chris Hadfield and Scott Parazynski also operated the shuttle's docking mechanism to latch the station and Endeavour together after the two spacecraft make contact. Kent Rominger flew the quarter-circle of the station, starting 600 feet (182.9 meters) below it, while slowly closing in on the complex, stopping at a point a little more than 300 feet (91.4 meters) directly in front of the station. From that point, he began slowly closing in on the station - moving at a speed of about a tenth of a foot per second (3 centimeters per second). 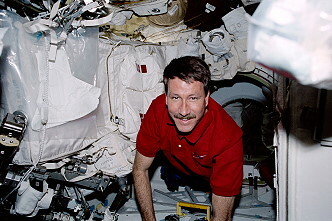 Using a view from a camera mounted in the center of Endeavour's docking mechanism as a key alignment aid, Kent Rominger precisely centered the docking ports of the two spacecraft. Kent Rominger flew to a point where the docking mechanisms are 30 feet (9.14 meters) apart, and paused for about five minutes to check the alignment. 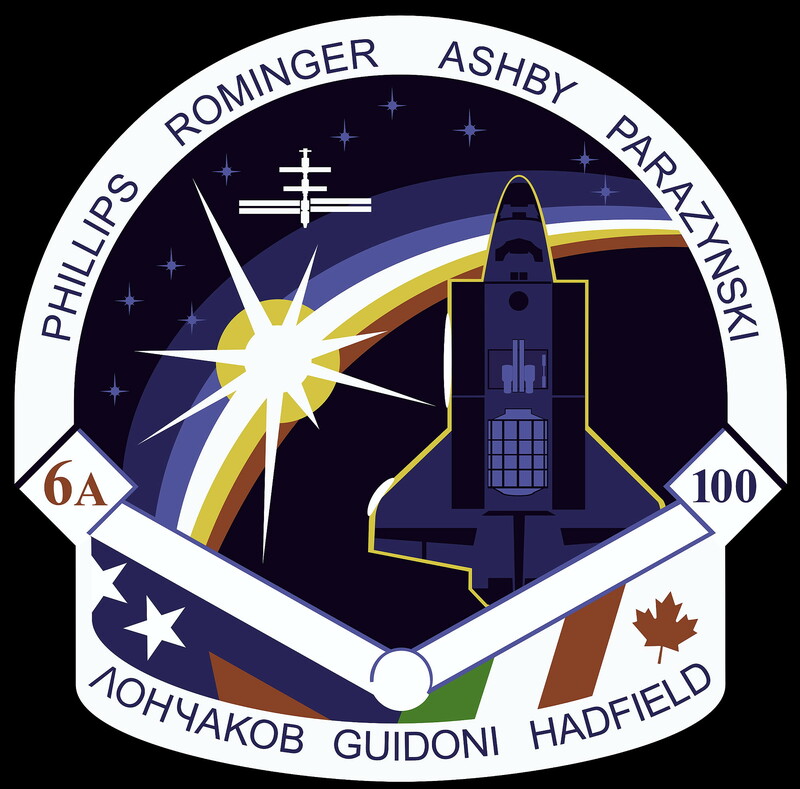 For Endeavour's docking on April 21, 2001, Kent Rominger maintained the shuttle's speed relative to the station at about one-tenth of a foot per second, and kept the docking mechanisms aligned to within three inches of one another. When Endeavour made contact with the station, preliminary latches automatically attached the two spacecraft together. Immediately after Endeavour docked, the shuttle's steering jets were deactivated to reduce the forces acting at the docking interface. 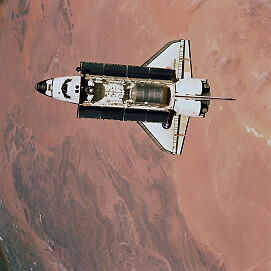 Shock absorber-type springs in the docking mechanism dampened any relative motion between the shuttle and the station. Once relative motion between the spacecraft had stopped, Chris Hadfield and Scott Parazynski secured the docking mechanism, sending commands for Endeavour to retract and close a final set of latches between the shuttle and station. 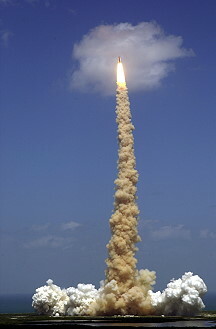 Endeavour became the first shuttle to visit the station's second expedition crew of Commander Yuri Usachyov and Flight Engineers James Voss and Susan Helms since they began their stay aboard the outpost in March 2001. The two crews did not greet one another in person until Flight Day 5 of the mission due to a lower cabin pressure that was maintained aboard the shuttle as part of the space walk preparations. The crews, however, used an outer station compartment as a type of "airlock" to allow them to exchange a few items early on despite the differing cabin pressures on each spacecraft. The first EVA was performed by Chris Hadfield and Scott Parazynski on April 22, 2001 (7h 10m) to install the Canadian built robotic arm (57.7 foot = 17.59 meters long) called: Canadarm2. 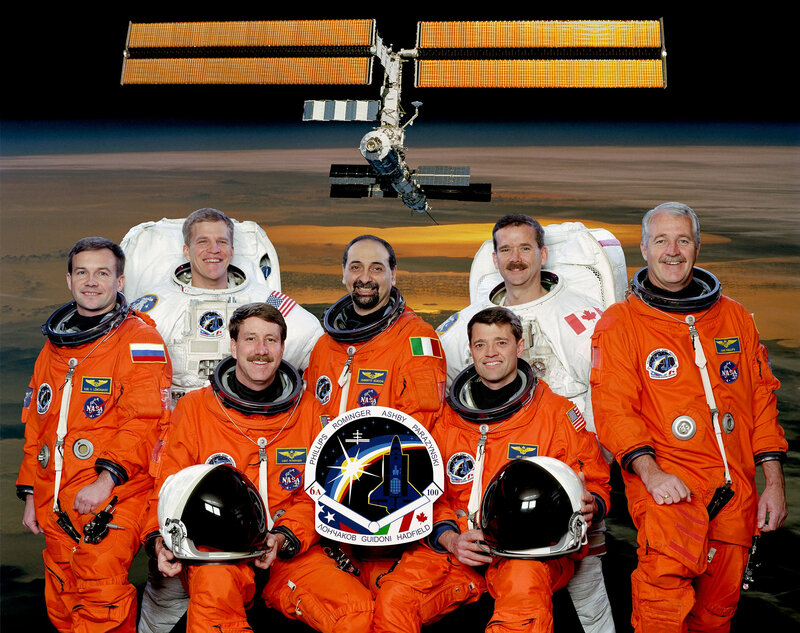 Chris Hadfield was the first Canadian in free space. As Chris Hadfield and Scott Parazynski were donning their spacesuits on Endeavour's lower deck, in the aft cockpit, Jeffrey Ashby powered up the shuttle's robotic arm. Jeffrey Ashby used the shuttle arm to lift a Spacelab Pallet holding the station arm and the UHF communications antenna from the shuttle's cargo bay. He then maneuvered the pallet, with the Canadarm2 and antenna attached, to latch to a cradle affixed to the station's Destiny lab. At that point, Chris Hadfield and Scott Parazynski left the shuttle's airlock and began their space walk. Chris Hadfield and Scott Parazynski connected cables that will feed the initial electrical power, computer commands and video between the station and the Canadarm2. They next installed and deployed an Ultra-High Frequency (UHF) communications antenna that enabled the station to conduct future space walk communications and that improved future shuttle-station communications. Then they released launch bolts that held the Canadarm2 secure during its trip to orbit, unfolded the arm and prepared it for control from inside the station. 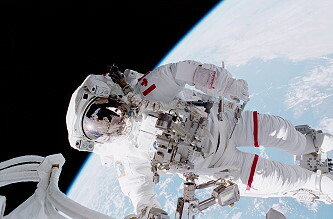 During much of the first space walk, Chris Hadfield worked from a foot platform attached to the shuttle's robotic arm, controlled by Jeffrey Ashby. 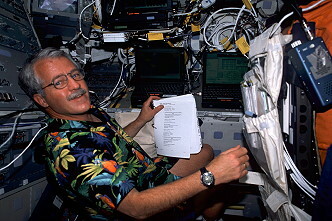 Scott Parazynski worked free-floating or from fixtures attached to the station. For the first task, connecting the initial station power, command and video cables to the arm, Chris Hadfield released a set of cables from restraints on the Spacelab Pallet to which the arm was attached. The four cable connections to be made will provide space station power, commanding and video to and from the Flight Support Equipment Grapple Fixture (FSEGF) on the pallet, which serves as the arm's initial base. Scott Parazynski connected the cables to the station's Destiny lab, enabling the arm to later be controlled from a Robotics Work Station within the lab. Next, the two space walkers removed the UHF antenna from its launch restraints on the pallet, and Chris Hadfield held it while Jeffrey Ashby maneuvered him to the position where the antenna was installed on the station. Scott Parazynski bolted the antenna to the station and connected cables between the new system and the complex. The antenna's booms then was deployed by the space walkers. Then, the space walkers turned their attention back to the robotic arm. They removed several insulating blankets from the arm and pallet and verified that station electrical power was supplied to the arm before beginning to release bolts that held the arm in place during launch. They sequentially released 32 smaller bolts called jackbolts that held tight eight large, four-foot-long (1.22 meter) "superbolts" that secured the arm in place on the pallet. As they were removed, the long superbolts were placed into a "quiver", a container that held them securely for a return to Earth on the pallet. Once the launch restraint bolts were removed, Jeffrey Ashby maneuvered Chris Hadfield at the end of the shuttle's arm to begin unfolding the station arm. As each of two booms were unfolded, the space walkers tightened bolts, called Expandable Diameter Fasteners, that made the booms rigid. The Canadarm2 was ready for its first operations once this space walk was completed, operations that had it "walk off" the Spacelab Pallet on the next day of the mission. 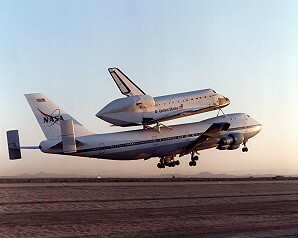 The hatches were fully opened and the shuttle and station crews greeted one another for the first time on Flight Day 5. Inside the Destiny lab, Susan Helms and James Voss, assisted by Chris Hadfield and Scott Parazynski, worked at the control center for the newly attached station arm, powering it up and moving the Canadarm2 for the first time. They maneuvered the new arm, checking its operation and finally latching a free end to a fixture on the station's exterior. The other end remained latched to a fixture on the pallet. Also on Day 5, Scott Parazynski and Umberto Guidoni used the shuttle's robotic arm to lift the Raffaello logistics module from the cargo bay and maneuvered it to a berthing port on the station's Unity module, where it was unloaded during the following days. At the end of Day 5, the hatches between Endeavour and the station were closed again in preparation for another space walk. The second and final EVA by Chris Hadfield and Scott Parazynski occurred on April 24, 2001 (7h 40m) to connect the Power and Data Grapple Fixture circuits for the robotic arm. Their second space walk began with Chris Hadfield and Scott Parazynski opening a panel on the lab's exterior and Scott Parazynski then connecting power, computer and video cables for the Destiny lab fixture to which one end of the Canadarm2 then was attached. Scott Parazynski made eight cable connections to prepare the arm to "switch ends" using the lab fixture, called a Power and Data Grapple Fixture (PDGF), as its base and the end attached to the pallet as its free end. While Scott Parazynski was working with the connections, Chris Hadfield climbed to the station's Unity module and removed an Early Communications System antenna, a box-shaped, 100-pound (45.4 kg) antenna that was used as part of an early station system that is no longer needed. 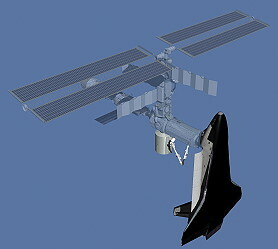 The antenna must be removed from Unity to clear the way for the arrival of the station airlock launched on the STS-104 space shuttle mission. Chris Hadfield carried the removed antenna back to Endeavour's payload bay, where it was taken into the cabin at the end of the space walk. Once the station crew had confirmed that power was provided to the arm through the connections made by Scott Parazynski, Chris Hadfield began disconnecting the four power, command and video cables that were installed between the pallet and station during the first space walk. The four cables provided the initial power, command and video to the arm but were now no longer be required and must be removed to allow the Spacelab Pallet to be unlatched from the station and eventually returned to the shuttle bay. While Chris Hadfield was disconnecting those cables, Scott Parazynski removed a Video Signal Converter (VSC) from the Spacelab Pallet that was now no longer needed for the arm's operation. 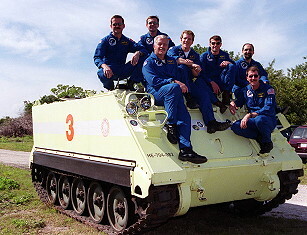 The unit was stowed aboard the station as a spare. The two space walkers then began stowing some of their tools while they monitored the movement of the Canadarm2, controlled from inside the station by station crew member Susan Helms, as it "switches ends". Now using the fixture on the exterior of Destiny as its base, the arm lifted the Spacelab Pallet, now attached to the arm's free end, and maneuvered to a parked position where it was locked in place overnight. The arm's move also cleared the way for the final space walk task, attaching a spare piece of station electronics equipment to an external stowage platform on the exterior of the Destiny lab. Working from a foot platform attached to the end of the shuttle's robotic arm, Scott Parazynski removed the spare piece of electronics, a critical part for the station's electrical system called a Direct Current Switching Unit, from a platform in the shuttle bay. Jeffrey Ashby then maneuvered Scott Parazynski to the exterior of Destiny, where, assisted by Chris Hadfield, he secured the spare unit to the stowage platform, in place for use by future crews if needed. Following the two space walks, the Endeavour and station crews engaged in the first dual robotic arm operations ever conducted in space, a "handshake" between the Canadian robotic arms for the shuttle and station that served to relocate the pallet in the shuttle cargo bay. Inside the station's Destiny lab, Susan Helms powered up the station's arm, with the pallet still attached to its free end, and maneuvered the pallet to a position high above the shuttle, within reach of the shuttle arm. 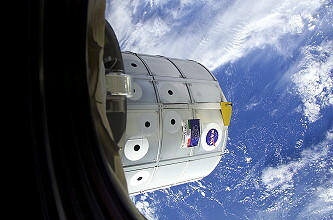 The station arm's maneuvers continued checks of the new arm with a payload attached. Then, aboard Endeavour, Chris Hadfield, assisted by Scott Parazynski, powered up the shuttle arm. 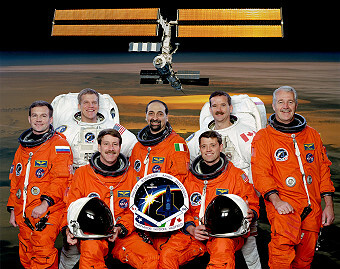 Chris Hadfield assisted with the operation of both arms at times during the day. Once the station arm had the pallet properly positioned, Susan Helms locked it in place while Chris Hadfield, at the controls of the shuttle arm, latched onto it. Susan Helms then released the pallet from the station arm and Chris Hadfield maneuvered the pallet, now affixed to the end of the shuttle arm, back to a position in Endeavour's payload bay to be latched for the return to Earth. Susan Helms, Chris Hadfield and James Voss performed further checks of the station arm's operation. The checks included a "dry run" where the arm will be maneuvered in the same positions that will be required to lift a new station airlock from the shuttle's bay and install it on the station's Unity module on the next space shuttle flight (STS-104), and the crews continued unloading and reloading - with trash, unnecessary equipment, and Earth-bound items - the Raffaello logistics module. 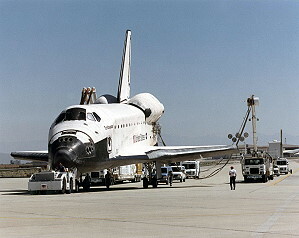 Kent Rominger fired Endeavour's small steering jets intermittently for about an hour to boost the shuttle and station altitude by several miles. 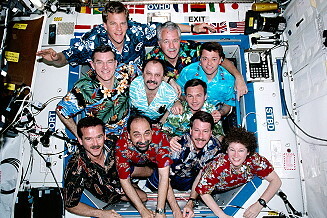 Then, the shuttle and station crews said a final farewell to one another and closed hatches between the spacecraft. 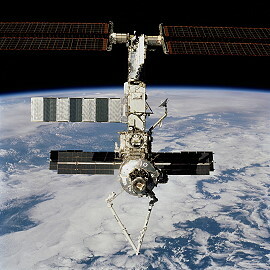 The undocking of Endeavour was delayed by a series of computer problems at the Station. Failures in the Station's command and control computers left only one of the three computers operating. They were all restarted by April 29, 2001, and the Shuttle RMS grappled the Spacelab pallet at 20:44 UTC. 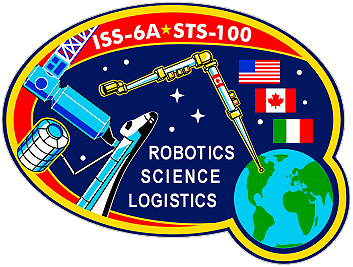 The station's Canadarm2 released it at 21:06 UTC, and the RMS berthed the pallet back in the Shuttle cargo bay. Once Endeavour was ready to undock, Chris Hadfield and Scott Parazynski sent a command that released the docking mechanism. The initial separation of the spacecraft was performed by springs in the docking mechanism that gently pushed the shuttle away from the station. Endeavour's steering jets were shut off to avoid any inadvertent firings during this initial separation. Once the docking mechanism's springs had pushed Endeavour away to a distance of about two feet (61 centimeters), when the docking devices were clear of one another, Jeffrey Ashby turned the steering jets back on and fired them to begin very slowly moving away. From the aft flight deck, Jeffrey Ashby manually controlled Endeavour within a tight corridor as he separated from the ISS, essentially the reverse of the task performed by Kent Rominger when Endeavour docked. Endeavour continued away to a distance of about 450 feet (137.2 meters), where Jeffrey Ashby began a close flyaround of the station, making almost three-fourths of a circle around it. Jeffrey Ashby passed directly above the station, then behind, then directly underneath it. At that point, Jeffrey Ashby fired Endeavour's jets for final separation from the station. The flyaround was completed a little over an hour after undocking.